The unit holds either a Sonics and Materials or a Ultrasonic Seal hand welder. This rugged press turns your hand welder into a versatile manual welding system. This system can be used for prototypes, short run production and many repair applications. The ultrasonics is conveniently activated by a switch mounted on the head that actuates just prior to contacting the part. 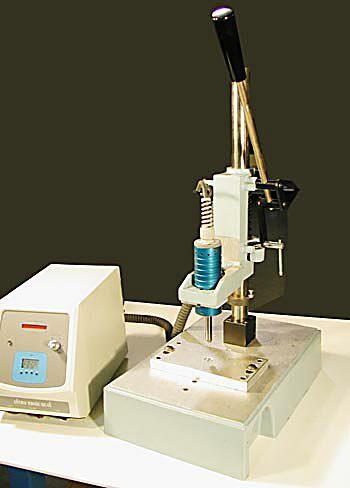 This press when coupled with a hand welder is a very low-cost way to ultrasonically weld, insert or stake plastic parts.